Temporomandibular joint disorder, or TMD, is extremely common, but many people may not realize that the cause of their chronic headaches is their jaw joint. Still, symptoms of TMD include headaches, ear pain, problems with chewing, dizziness, and clicking or popping in the jaw joint. If you suffer from chronic headaches and any of these other symptoms, you will want to get evaluated to find out if you could be suffering from TMD headaches. Why Choose Robison Dental Group for TMJ/TMD Therapy? If your headaches are caused by TMD, Robison Dental Group offers TMJ headache prevention therapy. Using the latest in neuromuscular technology including our K7 computerized unit, we can detect TMJ (temporomandibular joint) misalignment that might be causing your headaches and other pains. Robison Dental Group has helped hundreds of people eliminate the extremely painful symptoms of TMD. We'd be proud to help you as well. Our extensive post-graduate training in the treatment of TMD makes Robison Dental Group the only logical place to find freedom from this crippling discomfort and frustration. 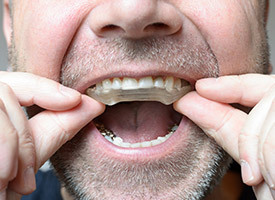 Sometimes, the underlying cause of a TMD is a misaligned bite, which places uneven stress and pressure on the jaw joint. To correct this, we need to properly align the rows of teeth to make sure they come together smoothly. We can reshape a few key teeth and place dental restorations to accomplish this, restoring balance and harmony to the bite, which should make any TMD-related symptoms go away. An occlusal splint is a type of therapeutic mouthpiece designed to treat TMD-related pain. A patient simply wears one to bed, and the splint will slightly adjust the position of the jaw and put it into a more relaxed and functional orientation. It can also protect the teeth from another common TMD symptom--teeth grinding. Over time, the jaw should adapt to this new position, enabling a patient to go throughout their day pain-free. 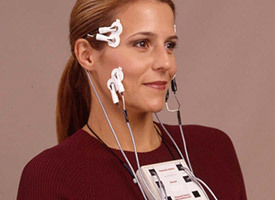 TENS stands for “transcutaneous electrical nerve stimulation,” and while that may be a mouthful, the way it works is actually quite simple. We’ll place a few electrodes around your TMJ and on painful facial muscles, and the machine will send gentle pulses into the area. This will stimulate blood flow, flush away inflammatory agents, and basically give the face a nice massage. This is a great way to provide immediate pain relief and relax potentially spasming muscles.